"This has become a family favorite, and a favorite at church pot-lucks. The best thing is how simple it is!" This came out a little dry for us. 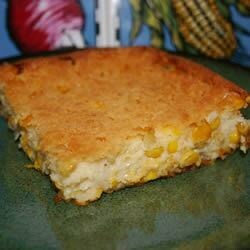 It was more like cornbread with corn in it. Not bad but I wouldn't call it corn pudding. Very quick and easy. Everyone likes it! I rinse the corn to get the "canned" taste out. Delicious! I would highly recommend substituting butter for margarine and sprinkling some sugar on top before baking. Enjoy! My daughter made this for Thanksgiving. We didn't have sour cream but substituted plain lowfat yogurt. It was very delicious-minus a couple of calories. Texture and taste was perfect.